Join Initiate Justice as we celebrate our 2018 wins and fundraise to continue our work in 2019. With your help, we helped pass SB 1437 (Skinner) – a historic retroactive piece of legislation that ended the Felony Murder Rule, grown our membership to over 8,500+ people and activated our inside organizers to win policy. – Cosponsoring statewide legislation to restore voting rights to people on parole, allow people to earn time off their parole, and MORE! – Introduce our Institute of Impacted Leaders. Help us continue our work. 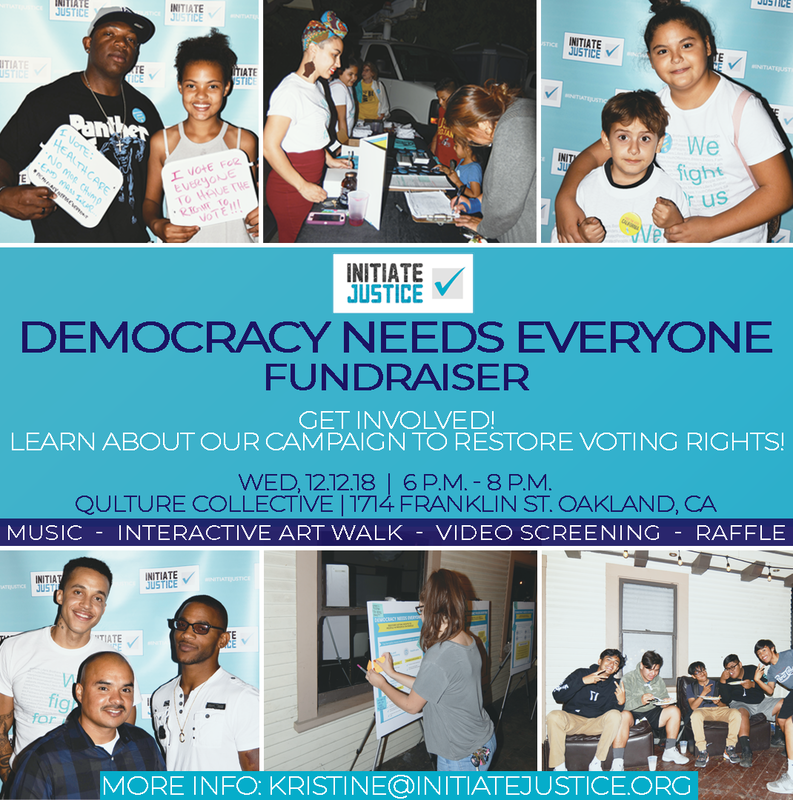 Join us on December 12, 2018, to mingle with friends, meet Initiate Justice staff members, view our interactive data gallery in advance of our “Democracy Needs Everyone” report release, and watch our “If I Could Vote” video featuring some of our amazing members. Make sure to bring cash with you, as we’ll also have a RAFFLE and t-shirt sale! Please let us know if you have any additional questions about access!